J. Jonah Jameson, Aunt May, Flash Thompson, Liz Allan, Betty Brant. Khrushchev was the leader of the Soviet Union when this comic was written: he had been succeeded by Brezhnev by the time it was published. P 18: The police officer who finds Flash is the first person of colour to appear in Amazing Spider-Man! He’s fairly obviously been drawn as a Caucasian and given a Hulk-like slate-grey complexion by the colourist, but it’s a small move in the right direction. P20: Peter Parker drops his Spider-Man costume into the waste-bin in his bedroom. When Stan Lee rehashes this story in Spider-Man #50, Parker leaves the costume in a trash-can on the street. It’s fairly petulant to keep throwing your toys in the bin. P21 “He’s calling me the biggest phony since the Cardiff giant” The Cardiff Giant was a supposedly fossilized human, “discovered” in Cardiff New York in 1869 and exhibited by P.K Barnum. So “biggest fraud since the Cardiff giant” means “biggest fraud of the century”. This is sheer bloody nonsense. One looks in vain for fight scenes in silver age Supergirl stories; issues of golden age Superman fly past without fight scenes, because there was no-one strong enough to challenge the Man of Steel. (Action Comics #4 is about Superman rescuing Lois from an out-of-control train.) And in any case, Spider-Man’s confrontation with Sandman is to all intents and purposes a fight scene (albeit a very unusual one): Sandman is shown throwing punches at Spider-Man and Spider-Man is shown dramatically dodging them. Page 20: Peter Parker finds Aunt May in a wheelchair (in a purple bathrobe and pink nightshirt) at the bottom of the stairs. He goes upstairs, and throws his Spider-Man costume away. According to the caption “The next morning...” he comes downstairs, finds the wheelchair empty, and is surprised that May is walking around by herself (in the same dressing gown). c: They are paying a full time night nurse, not otherwise mentioned. d: Her bedroom is downstairs. It seems clear that Ditko intended Peter Parker to come home, go upstairs for a few minutes, and come down to find Aunt May testing her legs. If not for Stan's illogical “The next morning...” caption, we would take it that the costume remained in the bin for literally only a few minutes. Peter appears not to have sold any pictures since the huge $10,000 payout he struck in issue #13. Assuming he pays the rent/mortgage a year in advance, that left him with $8,000 in the kitty; but now he says he can’t afford to pay for Aunt May’s medication. What is wrong with Aunt May? In #17 we hear that May has had “another heart attack”. The doctors tell Peter that she is a “very sick woman”. In #18 she is “recovering from a serious operation”. She has spent some time in hospital and spent several weeks recovering, but still feels tired, has dizzy spells (which Mrs Watson/Watkins treats with, er, cups of tea) and is not supposed to be left alone. The main treatment appears to be rest and medication. Old Aunt May Fine. How you? 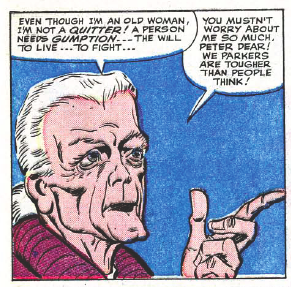 Aunt May jokes that she is “feeling like a sprightly 60 year old”, which only makes sense if she is really a great deal older than that. Why not arbitrarily say she adopted Peter when she was 60, making her 77 in the current stories? Are Aunt May and Peter Parker blood relations? This remark strongly implies that Peter Parker and May are both Parkers. which would only be possible if Peter were the child of one of May’s brothers. It would be highly unusual in the 1960s for a married woman to retain her birth-name; but Peter might very well have retained his — especially if Ben and May fostered him without legally adopting him. I think our best bet is to say that May has been married to Ben for perhaps as much as 60 years; that she has come to think of herself as part of his clan; and therefore thinks nothing of referring to her and Peter as “we Parkers”. It’s still an odd line; but any alternative explanation is odder. Stan Lee will eventually write a feeble story, “The Parents of Peter Parker” which establishes that Peter is the son of Richard (brother of Ben) and Mary Parker. Much, much later, May Parker’s birth-name will be given as “Reiley”. Before we start, I’d like you to pull your copy of the Silver Surfer #18 (first run) off the shelf. Page 17 sets us up for a big fight with Black Bolt, but on page 18 the Surfer backs away from the battle, and delivers a monologue instead. Are you ready? This is Stan Lee at his most…like Stan Lee. But all I won was hatred…and everlasting strife! So I have done with reason..and with love or mercy! To men they’re only words to be uttered and ignored! Since a fiendish fate has trapped me here with a hostile race in a nightmare world! I’ll forget my heritage..blot out my space-born ethic! No longer will I resist this earthly madness! No longer mine a lonely voice, pleading peace in a world of strife! From this time forth the Silver Surfer will battle them on their own savage terms! As a piece of characterization, this is makes no sense at all. The whole point of Stan Lee’s version of the Surfer is that he is moralistic to the point of being pious: how can he suddenly decide to give up morality in the way someone might decide to give up smoking? But this isn’t really about characterization. The speech is a statement of editorial intention, tagged arbitrarily onto the end of a comic. The readers are tired of the Silver Surfer’s endless sermons. Stan Lee’s re-imagining of Kirby’s amoral cosmic agent as a preachy jesus-freak has not worked out. So Lee gives notice that he is going to completely change the character. In fact, he’s going to hand him back to Jack Kirby in the same condition he borrowed him in: alien, amoral, prone to declare war on the human race at a moment's notice. Nothing comes of it. 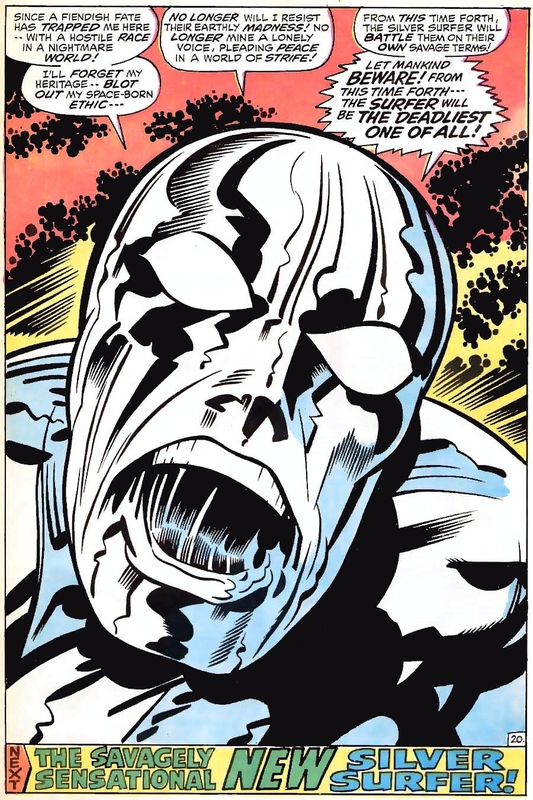 When we next see him, the Savagely Sensational New Silver Surfer casually mentions that he as “forsworn my vow to revenge myself on (humanity) for their reckless attacks on me”, and everything carries on much as before. Now: far be it from me to spoil a classic but isn’t this precisely what happens in Spider-Man # 18? Amazing Spider-Man #18 is the nexus-point of the conflict between Stan Lee and Steve Ditko. By this point, the two are barely on speaking terms. By Stan’s own account, they had argued so much about Spider-Man plots that he told Steve to go away and make up whatever stories he wanted from now on. But it’s not a happy arrangement. Stan Lee used to hype his own stories into the stratosphere, but he can’t resist gently stabbing Steve’s in the back. “The whole plot was dreamed up by Sunny Steve… A lot of readers are sure to hate it so if you want to know what all the criticism is about, be sure to buy a copy!" 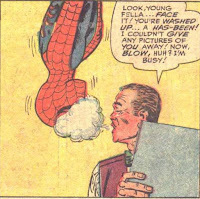 Our working hypothesis has been that shy bespectacled Steve Ditko thinks that the Amazing Spider-Man should be mostly about shy, bespectacled Peter Parker, and that arrogant, boastful Stan Lee thinks that the Amazing Spider-Man should be mostly about arrogant, boastful Spider-Man. Last issue, Ditko made it as clear as can be what the comic was going to be about from now on. When our hero has to chose between being the Spider or the Man, he has no doubt about the answer: he is Peter Parker. This issue we discover Peter Parker pushing Aunt May around the house in a wheelchair — and looking perfectly content with the situation. Peter Parker’s path to happiness — his enlightened self interest — is as Peter Parker. In the Annual, when his powers went away, he felt nothing but relief. This issue, he announces that he’s going forget all about being Spider-Man, be a good student, become a scientist, get married. And this is a not un-sensible plan. You aren’t morally obliged to fight crime just because you can stick to walls; any more than you are morally obliged to shoot balls through hoops just because you are 7ft tall. Even if we are thinking in terms of power and responsibility, then surely Peter Parker — who can whip up a set of web shooters in two panels and understand Curt Connors' lizard formula at a glance — can do much more good as a scientist than as a vigilante? It may be true that every time Spider-Man fails to catch a burglar, somewhere in the world an Uncle gets shot. But isn’t it equally true that every minute a brilliant science student doesn't spend in Prof Warren’s biochemistry class, someone’s Uncle dies of cancer? Ditko has written himself into a narrative hole. The logical conclusion of the story is for Peter Parker to recommit to being himself. But that would truly be the end of Spider-Man. 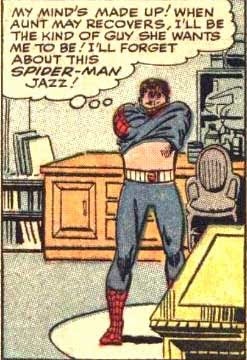 A whole series of events make him lose confidence: Jameson spends the whole issue gloating; Betty won’t even discuss what happened at the night club; he ends up phoning the police rather than catching some thieves; he is chased across Forest Hills by Sandman, resulting in little kids booing him. The episode feels like a whole sequence of closed off plot paths. There is a 3 page narrative dead end about the Fantastic Four. The Human Torch really doesn’t like Spider-Man — they feud like little kids — but he’s fair-minded enough to see that he can’t be a coward. I love this scene so much! It’s like a superhero locker room after a match: celebrities talking about other celebrities. (Oh dah-ling, you got simply marvelous notices!) The Torch uses his sky-writing shtick again, “Spider-Man, meet me at our last meeting place” But nothing happens; nothing comes of it. The Torch waits all night, but Spider-Man doesn’t show. Page 18 is a classic bit of Lee/Ditko melodrama. The panels are crowded, but Stan Lee’s overwriting is just what the episode requires. The page may be crowded with text, but you get double and triple viewpoints and multiple levels of irony. While Parker soliloquizes “Things are getting worse, Aunt May needs more medicine by tomorrow, and I’m still broke” we overhear, in the background, Flash threatening another lad (very possibly Seymour) “Are you the wise-guy who said that even puny Parker could lick Spider-Man? Well?? Are you?”. And then along comes the sucker-punch. It’s a bit like the phone call at the end of last issue, in that it comes from nowhere. It’s also a bit like the moment when Aunt May pawns her jewelry in issue #1 — a final twist of the knife. 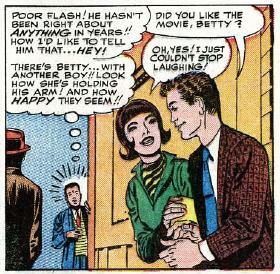 Peter sees Betty Brant on a date with another boy. Next month, he will be named “Ned Leeds”; the month after that, he will be written out; a year after that, he and Betty will get engaged. Many years in the future, he will become a super villain. But right now he’s just a very charming and good looking fella whose only purpose in the story is to make Peter Parker feel even worse than he does already. It’s not quite true. Peter effectively lost Betty in issue #11, because he didn’t have the moral courage to tell her he was Spider-Man. Aunt May isn’t sick because her nephew is Spider-Man: she sick because she’s very old. As Spider-Man, he can earn up to $10,000 in a single days work – how much could he make if he dropped out of school and became an intern in a science lab? (It isn't generally the case that expensive pharmaceuticals drop out of the sky and into the hands of “ordinary Joes”). If anything, the opposite is true: all of Spider-Man’s bad breaks are due to him being Peter Parker. But it feels close enough to the truth to destroy Peter Parker’s self-confidence. He ought to give up being Spider-Man, which he’s not very good at, and concentrate on being Peter Parker, which will make him happy. Head hung low, body slouched, he walks off into the distance. It’s the same image that wound up issue #12; the same image that John Romita will swipe for the iconic cover of Amazing Spider-Man #50. It’s the final frame of the comic: a clear signal that the story is over. Except, obviously, it can’t be. I think if you asked most comic book fans what happens in The End of Spider-Man they would say “Peter Parker quits being Spider-Man because everyone thinks he’s a coward; but Aunt May’s courage at dealing with her illness makes him recommit to the role.” But this is in fact only a description of of the last three pages. Peter puts his Spider-Man costume in the trash half way down page 20, but retrieves it on page 22, partly as a result of Aunt May giving him a Human Torch style pep-talk about perseverance and never giving up. Maybe it took Aunt may to teach me something I should have known! Only a weakling quits when the going gets tough! Sure I’ve had my share of bad breaks! Who hasn’t?? But I’ve been wasting too much time in self-pity!! Well, I’m done with that from now on!! Now, there’s nothing to stop me from being Spider-Man again!! Aunt May has enough gumption for both us us! I won’t have to worry about her any more!! As for J. Jonah Jameson, before I’m through he’ll be eating his words about me!! Fate gave me some terrific super-powers, and I realize now that it’s my duty to use them…without doubt…without hesitation...!! And that means Spider-Man is going into action again! I’ll fight as I’ve never fought before!! Nothing will stop me now!! The speech doesn’t make a whole lot of sense. Peter Parker hasn’t quit out of weakness; he’s made a positive, informed decision to be a scientist rather than a superhero. If it was only Aunt May’s sickness keeping him from being Spider-Man, then he hasn’t made any kind of moral decision at all: he was simply having a sabbatical until she recovered or (god forbid) died: now she's better he can go back to work. And what difference the medicine makes, I couldn't say idea: it wasn’t his dual identity that was stopping him from paying prescription charges. If Fate is the winding path your life is going to take, Destiny is where that path is going to end up: your ultimate destination. Some people will be kings and some people will be beggars, and that can’t be changed. Fate made the spider bite Peter Parker: that bite made it his Destiny to be Spider-Man. Spider-Man also thinks that it is his duty to be Spider-Man; or rather, that it is his duty to use his powers, and to use them non-reflectively “without doubt or hesitation”. Duty is rather a different thing from responsibility, I should say. Everyone has a responsibility to use whatever powers they have wisely; but duty implies a particular obligation that one has incurred. But this is blindly circular. Peter thinks that he has to reimburse Fate for making him Spider-Man by, er, being Spider-Man. Spider-Man’s speech is, like the Silver Surfer’s rant, a statement of editorial intent. It is the voice of Stan Lee over-ruling Ditko’s proposed new direction. The readers are tired of Spider-Man’s self-pity: Stan Lee promises to give them more of what they really want, namely – fight scenes. It really is as simple and amoral as that. You know, for someone who is making a case that these comics are literature, you don't seem to like them very much -- at any rate, you seem to have at least as many complaints as compliments. Does this reflect a deeply ambivalent attitude to the text, or just that criticism is more fun to write? I thought I had made it very clear that I thought "Return of the Green Goblin" was a classic. I also thought that I had made it fairly clear that I thought that "The End of Spider-Man" was a very good story; although (reading it carefully) it does seem clear to me that pages 1-19 is one thing, but pages 20-22 are a different thing. I do think that there is a conflict or dialectic between Lee and Ditko which produces contradictions in the text. I am surprised that you could read my comments on the Sinister Six, and #17/#18 and run away with the idea that I didn't like them. Individually, they are three of the best episodes of the original run. Considered as a triptych, they are are the definitive Spider-Man tale. but they will never do anything quite this good again. And neither will anybody else. As a piece of plotting, it is very nearly perfect. All the set-ups in the first half have pay-offs in the second; several of them have consequences over the next few issues. But in fact, it is the perfect ending to a perfect episode. I think you are misreading my attempts to describe what these comics are, in fact, like (and to distinguish them from Corporate Spider-Man of issue 39 onwards) as complaints. I do, of course, think that the comic has faults: the one-note characterization of Betty Brant from issue #12 onward, and Stan Lee's tendency to see everything as a wrestling match or a gladiatorial contest. But I don't, for example, think it is a fault that Spider-Man's inner voice (the one only we hear) is whiny and self accusatory, or that both Peter Parker and Spider-Man can at times be eminently dislikable figures. That seems to me to be part of the complexity and realism of the character. I don't think that it is a bad thing that "The End of Spider-Man" is made up of narrative dead ends: I think that's the whole interest of it -- a comic-book where arguably nothing happens. (Because nothing can happen, because Peter rightly wants to look after Aunt May rather than fight crime.) I don't even mean it as a criticism to say that Peter Parker's decision at the end of #18 is amoral. That's simply a description: he does not decide to carry on being Spider-Man on ethical grounds -- because a nightwatchmen reminds him of Uncle Ben, say, or because a little boy in Spider-Man mask is standing up to the Rhino on his own -- but because of fate and destiny. Maybe I should have said that it's an Existential choice. I don't really understand Steve Ditko's Objectivist faith -- the few pages of Ayn Rand I've read seem literally meaningless -- but part of it seems to involve the idea that since you are alive, it is your moral duty to carry on being alive, and since you are rational, it is your moral duty to be rationally engaged all the time. That you have to consciously choose to be whatever you are, not give yourself up to the flow? So perhaps "I have to be Spider-Man because it's my destiny to be Spider-Man" could be seen in those terms? But I prefer my reading: that it's simply a recognition of the rules of a superhero comic. The hero has to go on being the hero. A bit like Douglas Adams deciding that since, by definition, incredibly unlikely things were going to happen to his heroes, he had better put them in a space ship which had an engine which caused unlikely things to happen. 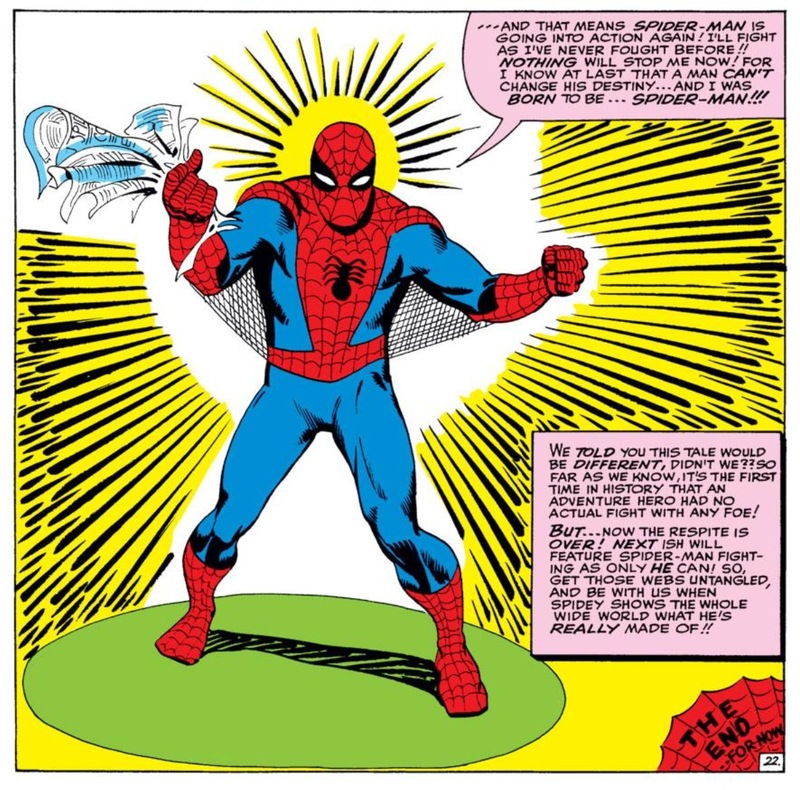 It may be that I'm over-aware of the conflict between Lee and Ditko, and over-inclined to look at contradictions in the text as symptoms of that relationship, where a True Fan would look for proper narrative explanations. (Aunt May is a bit deaf, and possibly a bit senile, so she mis-remembers Mrs Watson's name; and Peter kindly carries on calling her Mrs Watkins so as not to hurt May's feelings. And the narrator follows suit with a twinkle in his eye.) People of been looking at the comic for very nearly 60 years, and I've never heard anyone comment that the caption "the next morning" makes no sense; and I think looking at that kind of thing closely forces us to examine the internal dynamics of the comic. 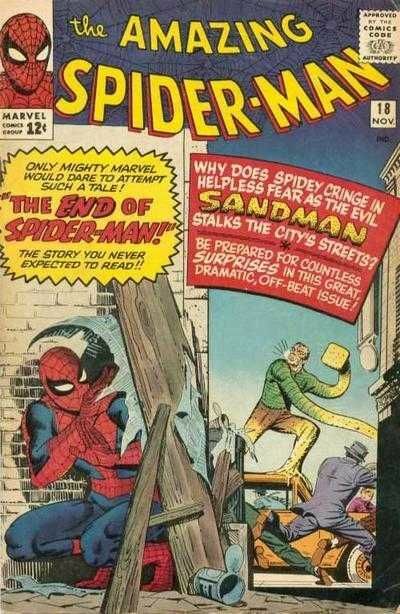 It might be that the confused chronology -- that school is turning out, Betty and Ned are are leaving the movie house, Peter Parker is going to bed and the doctor is making house calls all at roughly the same time -- is part of how the comic works: that despite the grounding in Lee and Ditko's New York, it's also happening in a kind of dream-time. But you need to make the observation before you can make that judgement. Of course, I don't remotely think that Stan Lee really knew which movie Betty and Ned were going to see, but once one has made the connection between Spider-Man #18 and "How I learned to stop worrying and love the bomb" the connection won't go away. All stories are true, as a very wise man once said. Have you perchance read John Sutherland's essay "Is Daniel Deronda circumcised?" Your first comment certainly makes a very compelling case that you like these comics! I have a different take on what is going: I think I am misreading your criticism of Spider-Man (the person) as criticism of Spider-Man (the comic). I think that explains everything: you have a lot of negative things to say, but they are not about the work that you're criticising. I've never read that essay, or heard of it. Is it worth tracking down? Finally -- I do hope you don't construe anything I have said as meaning that I think you should stop writing these, or that you should do them in any way differently. I'm finding the series fascinating. His question about the George Eliot book is basically "how can it come as a complete surprise to an adult male to discover that his birth parents were Jewish?" The interesting point (for me) is that the question has different kinds of answers -- "character" answers (he had never seen another man naked; he'd never heard anyone preach on that part of the Bible); "historical" answers (nineteenth century British Jews had stopped observing circumcision; medical circumcision was widespread among non-jews); "author" answers (George Eliot was a Victorian lady, she literally didn't know, or if she did know, she couldn't possibly have mentioned it); and "text" answers (in Victorian fiction, certain things simply don't exist: you have to assume that everyone is shaped like Ken or Barbie). Of course, the real answer is probably "It's a silly question". I was thinking that I tend more to "text" answers than to "character" answers -- when Peter Parker refers to an election that happened a decade before he was born, I think "Stan Lee has forgotten who is talking, here" rather than "Aha, so Uncle Ben must have chatted with Peter about politics over his wheat-cakes." Those books do sound like very much the kind of thing I enjoy reading. Frustratingly, none of them seems to have a Kindle edition, and I do resent having to bring actual physical objects into my home in order to read words in the 21st Century. I admit the relevance and interest of all three kinds of answers to literary questions, and I suspect what most intrigues me is the links between them -- when the in-text reason for Spider-Man making a certain choice arises from the extra-textual history of the Lee/Ditko partnership. And for the record, How to Mis-read Lord of the Rings (aka. Do Balrogs Have Wings?) remains among my very favourites of all your essays. Mike, I think it I something of a category error to see these comics as ‘literature’. It’s a little like the guy who hears a rock’n’roll record, notices the piano player makes an error a classical pianist would not, and concludes classical music must be superior. Whereas in fact the error is theirs, in assuming both can be assessed by the same criteria. I really don’t care about the continuity errors in early Marvel all that much. Andrew, your view of Objectivism seems to be ‘right-wing Americans who didn’t want to admit they’d been influenced by something so European as Existentialism’. Which may even fit with mine – ‘free market economist who wanted to pretend they’d also come up with a philosophy’. Particularly as I tend to think of Existentialism as a more effective narrative device than a philosophy. Gavin, if we disagree I think it's because you are using the word "literature" in a more restricted sense than I am. I absolutely to think the Spider-Man comics are literature; but I may not mean the same thing by assertion as you would mean if you made it. Well having (by implication) mentioned Sartre novels I don't read 'Spider-Man" the way I'd read those. (I have to say "I'd" has I have actually only read one!) I suspect you mean something more like "good" or "worthy of attention", which I would have agreed with. See, I think you could interpret the whole sequence as a conversation that Ditko is having with himself (no doubt partially inspired by his differences with Lee) with Spiderman's final declaration not being due to Lee's interference, but Ditko's attempt to square a circle re his objectivist beliefs. My grasp of Rand is as rudimentary as your own. I do know she believed in 'rational self-interest' as the road to happiness (for you and those around you) and inversely, despised altruism (a typical Randian contradiction - supposing you derived pleasure from helping others? ), so the fact that Parker is happier when not being Spiderman makes perfect sense in Randian terms - but that would all depend on his motives for being Spiderman in the first place. In that context, I think Spiderman's final speech is significant. You could distil Randian philosophy into the aphorism - 'To Thine Self, Be True', and I think that's what Ditko means by 'duty'. Parker chooses to be Spiderman not because it serves the greater good, but because by doing so he is being true to his own nature, his 'destiny'. He has become a proper objectivist. Any potential conflict between his new value system and Aunt May's health (ie objectivism vs altruism) are resolved by her recovery. How convenient! Andrew, you obviously have information on Lee and Ditko that I lack ("By this point, the two are barely on speaking terms. By Stan’s own account, they had argued so much about Spider-Man plots that he told Steve to go away and make up whatever stories he wanted from now on.") But still, in your reconstruction of the Lee parts and Ditko parts, I can't help but think of our friend Mr. Lewis's observations about most literary criticism being speculation about the genesis of the work, and his recollection that this speculation had never been accurate in his case. But it could be argued that "Lee" and "Ditko" in these essays are analogous to "left-brained" and "right-brained," in that while biologists have largely discounted the whole left brain/right brain dichotomy, it's still a useful label to put on distinctions between logical and creative thought (or, in this case, distinctions between superhero action and altar ego angst). Lee: In the early days "(Steve) would draw the strip any way he wanted...he would add in a lot of things I hadn't even thought of." Later on, Lee would say "Hey, let's use Sandman as the next villain – let's have Sandman kidnap Mary Jane – I might not say any more than that." Later still: "After a while, I wouldn't even say that much to Steve. He would just go and do whatever story he wanted." Interview with Jonathan Ross. Roy Thomas (who was in the Lee camp) has said that Diko would hand completed pages to Sol Brodsky (who was the office manager) without speaking to Lee at all. Lee specifically says that "The End of Spider-Man" was written by Ditko, and actually disses the story on the letter col, so my assumption that the tryptitch is the point at which Lee substantially hands the reins over to Ditko seems not unreasonable. I don't see how anyone could read "Turning Point", "The Enforcers", "The Man in the Crime Masters Mask" and "The Goblin and the Gangsters" and not feel that they were plotted in a radically different style from "The Sinister Six" and "Unmasked by Doctor Octopus". (Film noire gangster stories on the one hand, set piece superhero sparring matches on the other.) Given that Ditko's writing without Lee tends towards gangsters and Lee's writing without Ditko tends towards fight scenes, it is reasonable to suppose that the former are plotted by Ditko and the latter are plotted by Lee. When the text blatantly misses the point of some aspect of the artwork -- as when Lee thinks that Doctor Octopus's men are working for a two-bit house breaker like the Cat, or writes "the next day" captions which are chronologically impossible -- then it is reasonable to suppose that the person-who-created-the-plot and the-person-who-wrote-the-words are different, and failing to communicate. This is even more compelling when we have testimony from both parties that this was, in fact, the case. If we took C.S. Lewis's claim seriously, then we would have to abandon most forms of literary criticism. (The Villa Dilodati competition is of NO interest to our close reading of Frankenstein? Really?) It would almost force us into that kind of structuralism / New Criticism where no such person as Milton and no such event as the English Civil War ever happened and Paradise Lost just spontaneously wrote itself. Lewis's claim that no-one who had speculated about the origins of his own work had ever been right, is I think, a tactic to enable him to "just know" that Biblical source criticism can't be true. There is a nice letter which I can't be bothered to look up right now in which he comments on an essay someone has written about his own work. He points out which guesses about sources and influences are correct; which are plain wrong; and which are wrong but still good guesses. So the 100% failure rate story isn't completely true. My essays are admittedly speculative. Clearly my theory of the Spider-force, and my idea that Spider-Man's personality is a kind of Freudian triad can't possible be true. But I find them a useful way of talking about stuff which is definitely happening in the text. If you want to attempt a Sherlockian reading of Spider-Man (which treats the comics as a record of the life of a real historical character) I would love to read it. But that's not what I'm doing. I will defend my idea that a conflict between two creators is reflected in the text to anyone. It is striking that you make general criticisms of the validity of my whole project (rather late in the day) rather than commenting or criticizing the specifics. What, on your view, is that "The Next Morning..." caption on page 20 doing there? If I am wrong in thinking that it indicates a fault line between artists and text-writer, what better explanation do you have? Have the Parker's retained Mrs Watkins/Watson as a full time home help and carer? Is there an invisible night nurse? Of course, one good answer might be "it doesn't matter"; but that's as much as to say "I don't think close reading popular culture is a valid exercise". Which may be true, but it isn't a very constructive (or kind) thing to say. I've evidently struck a nerve, and I apologize. My comment was made much more lightheartedly than it seems to have been taken. I've enjoyed the series, although the subject matter is a bit outside my wheelhouse. I acknowledged from the outset that "you obviously have information on Lee and Ditko that I lack." Your first comment fleshes this information out. That is helpful, and lends credence to the overall thesis. I think there's a fairly significant difference between a structuralist/New Critical reading that won't allow for known facts about an author's life and historical context, and a cautious reading that recognizes the importance of known biography and history on a text, but tries not to project biographical or historical considerations based on one's reading of the text. We've all known the type of Beatles fan who projects the acrimony of their break-up into their understanding of every late Beatles and Lennon and McCartney solo song. If we're talking "How Do You Sleep?" we're on fairly safe ground; "Let 'Em In" is another story. "It is striking that you make general criticisms of the validity of my whole project (rather late in the day) rather than commenting or criticizing the specifics." This is partly because I tend to be an observer of patterns, rather than a nit-picker. And it takes time for patterns to develop. But really, "criticisms of the validity" is far beyond anything I intended. Nowhere did I write, "This is all rubbish; you should scrap the whole thing." In fact, what I intended by my final paragraph was to say that the Lee-Ditko distinction is useful, even if we found sworn testimony to the effect that the genesis of certain bits was not what you thought they were. But if we're going to talk about specifics, I think that certain things you're making a point of are probably unintentional: the wildly differing payments Peter seems to be receiving for his photos, for example. I think that in each case, Peter makes exactly enough to drive the plot along: always enough to solve his immediate problem, but not enough to let him retire from the photography business. Aunt May is a Parker because they're all Parkers, and we're not intended to think too hard about genetics. (FWIW, if one needs an in-universe explanation, I think yours is best.) I always assumed that your overthinking these details was purposeful, for humor. Some of us think you're quite the witty writer. But seriously, I did not mean this seriously. And I'm just one guy, far removed from real comic book fandom. My opinion is, quite literally, meaningless. Keep calm and carry on. Just discovered this site by accident... Very interesting points made, I've had this issue for 30 years and never noticed some of this before. I will have to dig out the issue and re-read it. I look forward to reading the rest of this blog also when I have the time. But I'm very impressed with what I see so far.